About AcetalWhat is Acetal (POM)? Synthetic polymers are made up of large molecules built from repeating subunits (monomers). Homopolymers are composed of repeating monomers of a single molecular substructure while Copolymers are composed of several different monomer types in combination with one another. Acetal is a naturally white, high tensile strength “thermoplastic polymer” (a plastic material, that becomes pliable or moldable above a specific temperature and solidifies upon cooling.) Its transition temperature, from a hard into a viscous or rubbery state is 175° C / 347° F for the homopolymer and 162°-173° C / 324°-343° F for the copolymer. Why is Acetal used so often? Acetal is used to produce products that are highly resistant to abrasion, heat, water absorption and organic chemical compounds (i.e. hydrocarbons) and spans the material properties gap between most plastics and metals. It is used when you need a strong, slippery and/or flexible part for sliding mechanisms in automotive, medical, industrial and commercial applications. What does Hi-Tech Profiles use Acetal for? We stock Homopolymer (Delrin®) and Copolymer (Kepital®) Hollow Rod in standard 5’ lengths from ¼” through 2½” OD with ID sizes ranging from 1/8” to 2¼.” We will also issue custom quotes for tubes and profiles in various other lengths and sizes. We further produce Sheet and Strip products in both Homopolymer and Copolymer Acetal. Hi-Tech Profiles specializes in the extrusion of tubing, hollow rod, bushing stock, and custom shapes. 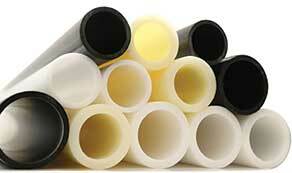 We offer a complete line of Nylon and Acetal in addition to most other engineered thermoplastics. The Hi-Tech Profiles' team of professionals, with over 100 years of combined experience in plastics and extrusion, work together to handle even the most challenging extrusion applications. Hi-Tech is proud of the service we render, and proud of the impressive list of customers we serve.